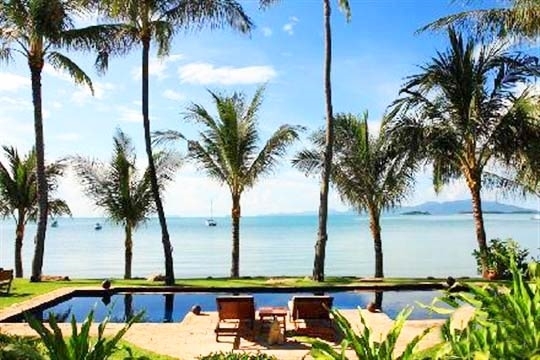 It's easy to see why Ban Haad Sai (Thai for ‘The House on the Beach’) is so popular. Lazing in a hammock slung between two coconut trees; sea on one side, pool on the other, and a host of modern comforts within barefoot reach, it's one of those places that makes you think "I could get used to this." 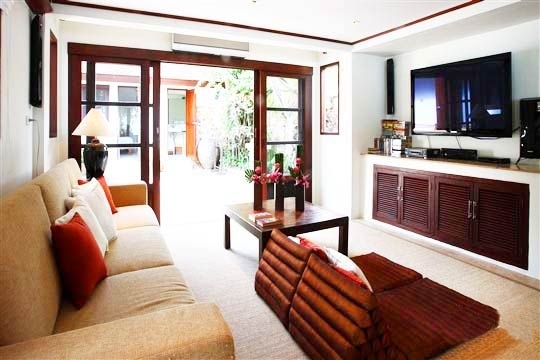 The two comfortably furnished living pavilions and the two double master suites offer the best seats in the house: each of these rooms overlooks the wide beachfront lawn and pool. As a result, those allocated the guest bedrooms set back in the garden may feel a little cut off from the beachside experience, but they will be well compensated by plenty of space on the poolside terraces where a large hammock, sun loungers and daybeds allow either shaded or sun drenched repose. There's no need to inconvenience yourself, even at meal times, because the long outdoor dining table is but a few steps from the pool deck. This is a fabulous place to feast on dishes from the varied suggestion menu (provisions on guest account), all prepared by an in-house chef who can also turn his hand to special requests. 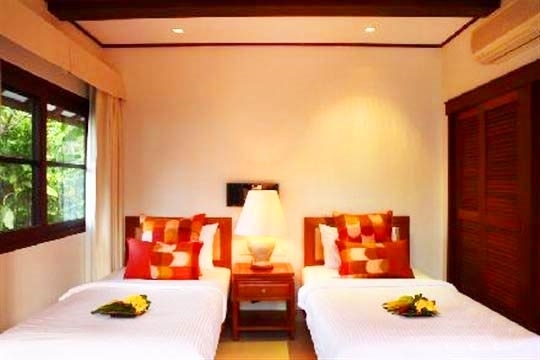 Although you quickly feel at home at Ban Haad Sai, you can distance yourself from the usual domestic chores thanks to the two maids who keep things in order, and an accommodating villa manageress is on hand to offer information, organise excursions and help with travel plans. Even if you choose to go nowhere, there's plenty to keep you entertained with a well-equipped gym, a dedicated AV room for movie nights and an excellent music system that can be piped out to the garden for a special 'desert island disc' moment. Interesting antique furnishings, particularly in the lounge and dining pavilions, are part of what give this villa its distinctive charm. The mature garden hides attractive Asian statues and friezes among its many nooks and crannies and boasts a variety of rare, colourful species. Proximity to the road means a slight traffic buzz, especially in the rear guest rooms, and you may hear the brief roar of an occasional plane overhead, but the villa remains reassuringly private and removed from the world outside and the convenience of the location makes up for any slight disturbance. 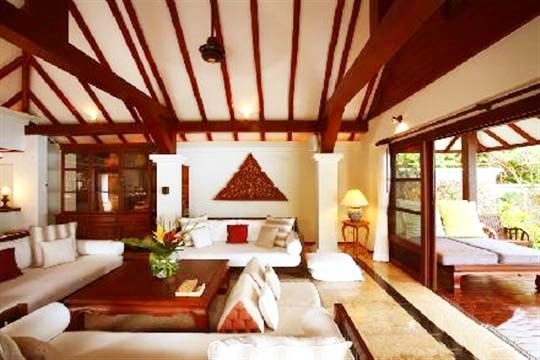 A luxurious beachfront pool villa, ideal for larger groups. 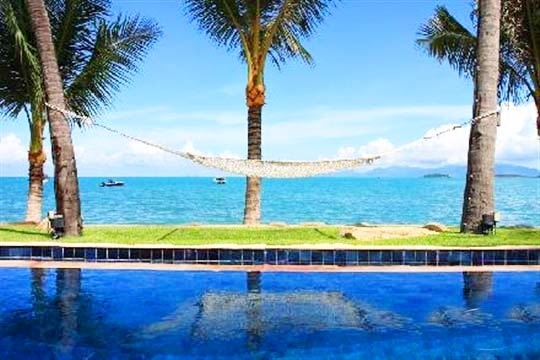 There's something exceptional about floating in a pool right by the sea, and at Baan Haad Sai you certainly appreciate the surroundings with views across the bay to outlying islands and Samui's famous golden Buddha. 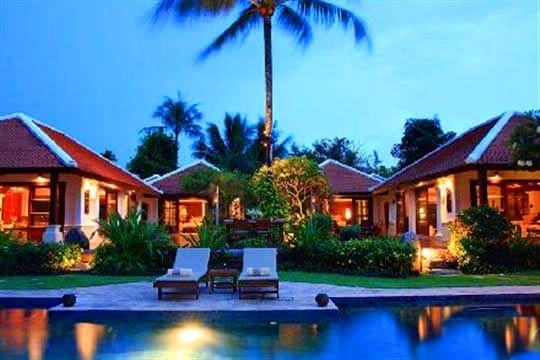 The beachside lawn, garden and decking that surround the pool add to the pleasure, and make this villa rather special. Ambient noise is a factor at Baan Haad Sai with a road directly behind the property, boats leaving from the nearby jetties and planes taking off from the airport. 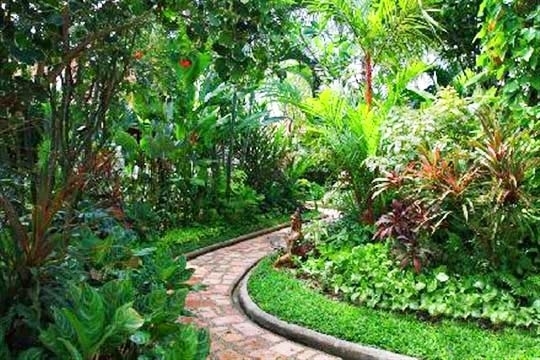 However, the villa is well shielded from neighbours by high walls and foliage and therefore remains very private. Ban Haad Sai sits right at the centre of Big Buddha Bay, with low key resorts and private houses on either side of its walled grounds. This is one of the island's less busy, but still popular beaches. The waters are not crystal clear, but perfect for swimming all year round. It is also a popular beach walk and jogging spot. Three jetties, about 200m down the beach from the villa, serve boats to the increasingly popular nearby islands of Koh Phangan and Koh Tao. Stunning views right from the property take in the former. Samui's famous Big Buddha statue watches over the bay, situated around half an hour's walk along the beach on a small island. Large roadside gates open into a courtyard with a carport on the left, below the gym and guest bedroom. The office and staff quarters (including a kitchen) are to the right. 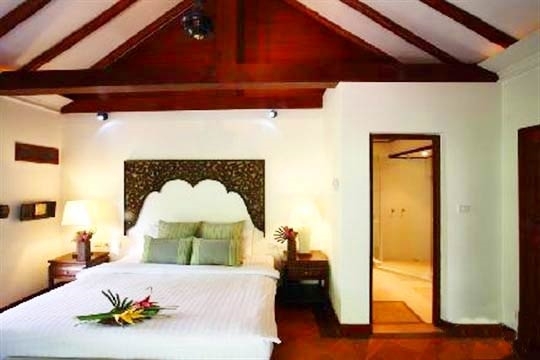 From there, attractive landscaped pathways lead past the four guest bedrooms to two master suites, two living pavilions and a 12m beachfront pool, all surrounded by lawned gardens. 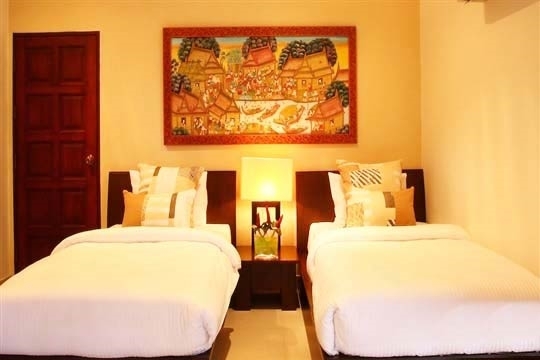 The two comfortably furnished living pavilions are connected by a wooden deck with views across the pool to the ocean. Each has its own L-shaped, wrap-around terrace with daybeds, while a sunken garden adds a tropical hue. 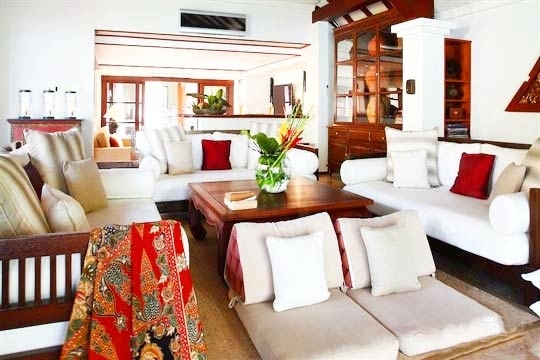 The living pavilion on the right (as you face the sea) contains a well-equipped kitchen and breakfast bar, with a large square dining table seating 12 and a modest lounge area decorated with antique Asian accessories. There's a sofa, TV cabinet (satellite and DVD) and sophisticated music system. 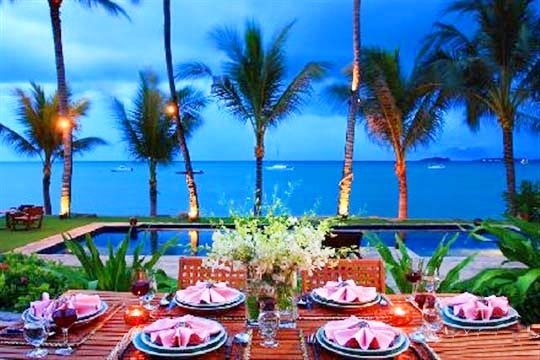 An outdoor dining table on the terrace seats 14 and can be moved to the pool deck for social gatherings. The left-hand pavilion houses the main lounge, furnished with antique cabinets and three soft white sofas set around a wooden coffee table. A sunken section to the rear has been converted into an AV room with a wall mounted Samsung flat-screen TV and surround-sound speakers for cinematic viewing, plus two mini-bar fridges to keep guests refreshed. 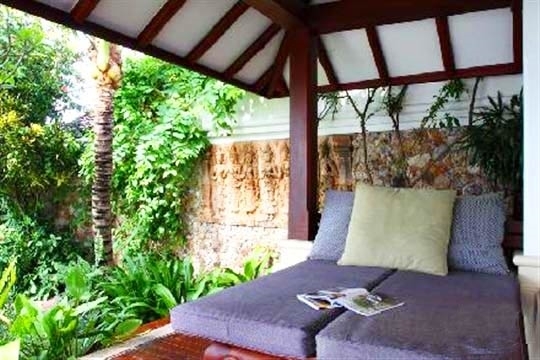 The covered terrace to the front of the lounge is furnished with a comfortable rattan sofa set and a double day bed. 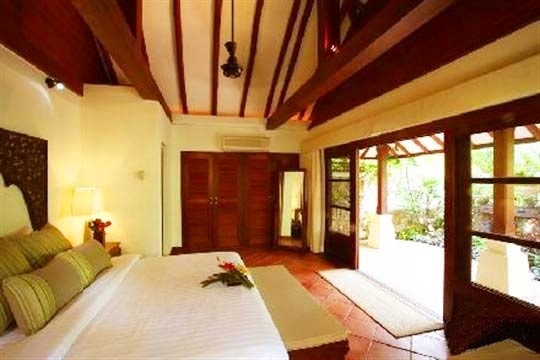 The two master suites sit side by side in the centre of the property, with doors sliding open onto garden and sea views. Each features a king-size centrally placed bed, built-in wardrobes, TV and DVD. 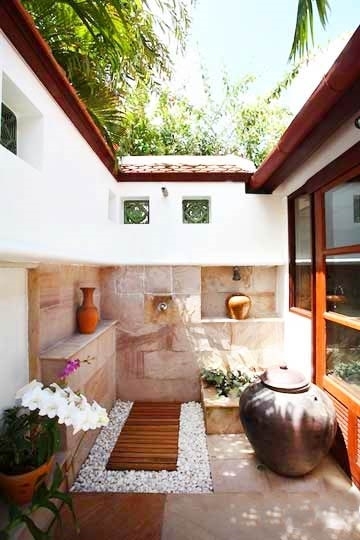 The two ensuite shower rooms open onto small garden courtyards with sunken tubs for outdoor bathing. The four guest bedrooms (in two buildings; each with a king- and a twin-bedded room) sit behind the master suites in the garden. Each has its own stone courtyard (but no view of the sea). 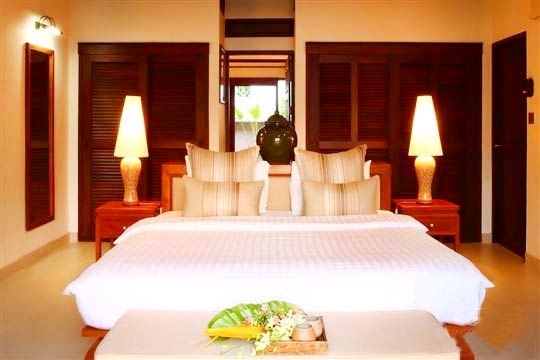 Decorated with Asian art, the rooms also have air conditioning and ceiling fans but no TVs, while the four ensuite bathrooms feature glassed in rain showers. The roadside annex contains an additional first floor guest room which looks out over the garden and would be ideal for a nanny. 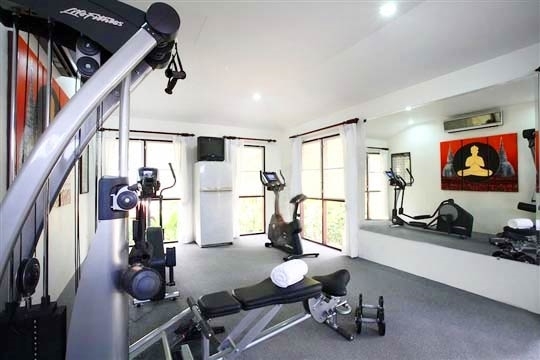 The well equipped gym is adjacent and shares a stand-alone shower room with the bedroom. Upon arrival at the villa you may be required to pay a security deposit. Any applicable security deposit will be returned to you prior to departure less any extra charges or costs for accidental damage to the property. 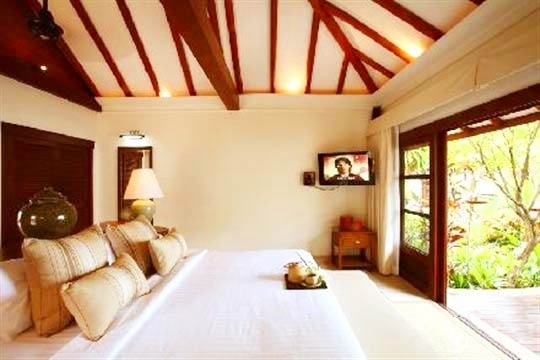 7 bedroom villa located in Bang Rak-Big Buddha, Koh Samui. Ideal for Beachfront, Body and soul, Bring the relatives, Gastronomic delights, Fair share for groups, Party pads, Sensible for seniors, Room with a view, Perfect for weddings.